I am 61 years old-really-- and am a retired school librarian--. I absolutely love to crochet-- and I knit too--just not as often. I am a professional member of the CGOA-Crochet Guild of America- a super organization. I was born in Liberty, New York, a small town in the Catskill Mountains. I graduated from Liberty Central High School and received my B.S. Ed. from the State University of New York at Geneseo, and my M.Ed. from Prairie View A&M University. I have lived in New York, New Jersey, Michigan, Florida, South Carolina and Texas. I have 6 children, and 8 grandchildren--so far. My youngest son lives with me in Houston, TX.--where I have been for the last 22 years. 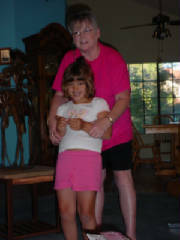 This is a picture of me and my grandniece, Samantha. Movies-- not sure --don't watch too many. I think "Sleepless in Seattle" is my all time favorite-- probably because of the music.